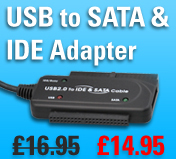 Our USB to IDE and USB to SATA connection kits have saved many a frustrated engineer or customer with a failed PC but with important data that they need to recover from the hard drive. Our wide range of innovative products and low prices keep you ahead of the game with all the cable connections you need day to day. Not sure it does the job??? Call our friendly staff for confirmation on any of our products functionality. Whether you need to test a DVD-R or rescue data from a 2.5" or 3.5" IDE or SATA Hard drive we have the cable kit for you! For traveling technicians a caddy may be too bulky to carry in a brief case, a USE to IDE or a USB to SATA cable kit may be your only option, we know that yet more wires is the last thing you need that is why we try to stock the most flexible kits to make your life easier!